While overprescription of antibiotics in humans is a viable issue, recent statements from WHO express heightened concern over the ramifications from their misuse in the meat industry. A recent report from the World Health Organization describes the dangers humanity faces from overprescription of critical infection-fighting drugs, which has led to both superbugs and antibiotics' dwindling efficacy, making humans vulnerable to infections doctors otherwise regarded as benign. While overprescription in humans is a viable issue, recent statements from WHO express heightened concern over the ramifications from their misuse in the meat industry. “Stop Using Antibiotics in Healthy Animals to Prevent the Spread of Antibiotic Resistance” is the title of WHO's latest press release, reiterating a message that has been clear for decades. The current culture of force-feeding antibiotics to livestock presents a danger to millions of humans. At present, animals used for livestock are fed around 80 percent of prescribed antibiotics worldwide. The measure has been perpetuated by the low cost of the medicines, as well as antibiotics' proven ability to accelerate growth and weight gain in livestock, effectively speeding up the process of food production. In 2015, the U.S. used 34.3 million pounds of antibiotics on animals. 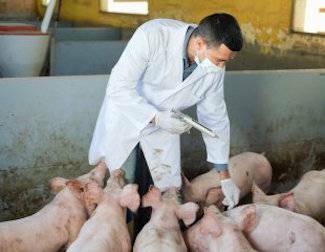 The result is antibiotic-resistant bacteria in animals and humans through food and airborne pathogens. At present, 700,000 people die each year from antibiotic-resistant infections, and it is predicted that this number could increase to 10 million by 2050, making low-risk operations like hip replacements and treatable urinary tract infections a new health crisis. The Guardian calls the collapse an “antibiotic apocalypse,” wherein the world is set to face the same surgical risks it did before 1928, when penicillin was discovered. Essentially a century’s worth of medical advances could be reversed. As Tedros Adhanom Ghebreyesus, director-general of WHO, confirms, “A lack of effective antibiotics is as serious a security threat as a sudden and deadly disease outbreak.” This is due in part to a lack of replacement therapies. In its statement, WHO warns that “there are very few promising options in the research pipeline.” The Guardian points out that this is precipitated by the “failure of pharmaceutical companies to investigate and develop new sources of general medicines for the future.” Perhaps, because what’s broken is still paying off. The threat of antibiotic overprescription has been clear since the 1960s, according to Tom Philpott, co-author of Big Chicken: The Incredible Story of How Antibiotics Created Modern Agriculture and Changed the Way the World Eats. But it wasn’t until this past January that the U.S. Food and Drug Administration made any kind of regulatory change to address the escalating crisis, asking that the livestock industry no longer use antibiotics to accelerate the growth of animals. However, the language used by the FDA has left an opening for the agriculture industry to continue its use of antibiotic treatments, allowing them to be prescribed and used as preventative medicine—treating antibiotics as prophylactics, with plenty of room for indiscretion. While it is is a highly regarded resource, WHO is not a regulatory body, and any reform must happen at the level of government. The troubling lack of concern from the federal government leaves little hope that there will be any change to FDA standards. Given the situation, vegan diets may be one of the main ways to resist the increasing use of antibiotics in livestock, protecting both animal rights and our own immunity to pathogens. Sophie Linden is an editorial assistant at AlterNet's office in Berkeley, CA.